The MPU is a compact Automated Vehicle Locator (AVL) solution for the road weather monitoring community. When connected to a Mobile IceSight sensor, the MPU serves as a gateway for collecting and viewing real-time, location based road condition and atmospheric data. The MPU uses its integrated Wi-Fi, cell modem and GPS technology for a low cost and easy to implement data portal. Smart data push rules are used to send data, when you need it, to a cloud based software system or your own database. This limits costs of cellular data packages. Store and forward technology is used when the vehicle is not in communication range. Coupled with a Glance subscription, real-time data is displayed on an intuitive Google Maps interface ideal for fleet management. Each vehicle is displayed on the map with color coded trails based on surface temperature, surface condition, surface friction or air temperature. Click on a particular vehicle and a comprehensive real-time tabular and graphical data display is shown. All data is archived and can be downloaded from the “more details” page. A Wi-Fi hotspot is served up from the MPU that provides a real- time dash display for the operator. The display can be viewed through any mobile phone/tablet/laptop browser. Simply connect to the Wi-Fi hotspot with your smart device and navigate to the provided URL. The Mobile IceSight Sensor connects to the MPU enclosure via a waterproof rugged connector. 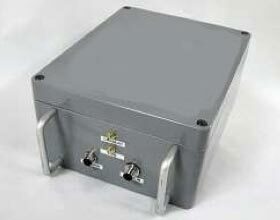 A combined GPS and cellular antenna mounts to the outside of the vehicle and connects to the MPU enclosure. In most cases the MPU is powered from 12 VDC supplied by the vehicle directly connected to the battery or through the cigarette lighter. A connection to the vehicle ignition switch regulates the power.